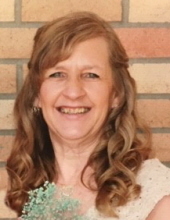 Rebecca "Becky" Schroeder, age 61 of New Hampton, IA passed away on Monday, January 14, 2019 with her family by her side. Funeral services for Becky will be held at 10:30 AM on Thursday, January 17, 2019 at Harvest Church in New Hampton and at 10:30 AM on Friday, January 18, 2019 at Immanuel Lutheran Church in Cedar Falls, IA with Pastor Doug Harvey officiating. Burial will follow funeral services on Friday at Waterloo Cemetery. Visitation will be held from 9:30-10:30 AM on Thursday, January 17, 2019 at Harvest Church in New Hampton. There will be an evening visitation from 5:00-7:00 PM on Thursday at Immanuel Lutheran Church in Cedar Falls and will continue at the church one hour prior to funeral services on Friday. Online condolences may be left at www.conway-markhamfh.com. Memorials may be directed to Becky’s family. Becky was born August 18, 1957 the daughter of Richard and Joyce (Crowder) King in Ottumwa, Iowa. She moved with her family to the Waterloo area where Becky graduated from Waterloo East High School. After graduating, Becky was united in marriage to Steven Adams in May of 1975 at St. John’s Catholic Church in Waterloo, IA. The couple welcomed two children, Steffanie and Jacob and later divorced. Becky worked for Osco Drug in Waterloo for several years before working at O’Neal Steel. Most recently, she worked for the United States Postal Service in Frederika, IA. In 2014, Becky met Dean Schroeder and the couple wed on May 12, 2017 making their home in New Hampton. Becky enjoyed quilting and sewing, being outdoors, traveling and especially sight-seeing with Dean on the Harley. Her granddaughters were the greatest joy! Those left to cherish Becky’s memory are her father, Richard King of Waterloo, IA; her husband, Dean Schroeder of New Hampton, IA; her children, Steffanie (Greg) Brunson of Evansdale, IA and Jacob (Jess) Adams of Waterloo, IA; stepson, Andrew Schroeder of Waterloo, IA; her granddaughters, Hailey and Britley; her siblings, Joni (Jim) Florey of Elk Run, IA, Sandy (Joe) Soldwisch of Waverly, IA, Teressa (Donny) Scoggin of Evansdale, IA, Rich (Julie) King of Waterloo, IA and numerous nieces and nephews. She was preceded in death by her mother, Joyce and sister, Cynthia in infancy. To send flowers or a remembrance gift to the family of Rebecca "Becky" Schroeder, please visit our Tribute Store. "Email Address" would like to share the life celebration of Rebecca "Becky" Schroeder. Click on the "link" to go to share a favorite memory or leave a condolence message for the family.